Virginia History Trails is an easy-to-use travel app, free for download on Google and iOS. 1. WHAT IS THE VIRGINIA HISTORY TRAILS? Virginia History Trails is a collection of historic destinations that reflect the stories of the first 400 years of Virginia’s dynamic history. It will promote tourism throughout all regions of the Commonwealth while inspiring, educating and stimulating awareness of Virginia’s role in the creation of the United States. The Virginia History Trails is designed to be a lasting legacy beyond the 2019 Commemoration, encouraging generations of Virginians and Americans to pursue a deeper understanding of our shared history. 2. WHAT IS THE 2019 COMMEMORATION, AMERICAN EVOLUTION? American Evolution commemorates the 400th anniversary of historical events that occured in Virginia in 1619, which continue to influence us today. 3. WHO ESTABLISHED THE VIRGINIA HISTORY TRAILS? The Virginia History Trails legacy project was developed through a series of roundtables and committee meetings to showcase Virginia’s historical sites, to improve the accessibility to this information and expand the Commemoration’s statewide engagement. 4. HOW DOES THE VIRGINIA HISTORY TRAILS DIFFER FROM EXISTING TOURISM TRAILS IN THE STATE? The Virginia History Trails is a curated list of stories developed to inform modern day explorers of the 400 year arc of history from 1619 until today. Additionally, each of the trails help to promote locations that are linked to these historical events and reflect the 2019 Commemoration themes of democracy, diversity, and opportunity. 5. WHAT IS A “TRAIL”? 6. HOW WERE THE SITES/STORIES CHOSEN AND WRITTEN? 7. WHERE CAN I EXPLORE THE VIRGINIA HISTORY TRAILS? Spanning every region across the state, the Virginia History Trails make it easy to discover and explore all the great historic sites and regions across the Commonwealth. 8. HOW DO I START EXPLORING? The Virginia History Trails app is the smartest way to explore 400 years of Virginia history! Simply download the app and search by interest, location or discover what’s nearby! 9. HOW DO I DOWNLOAD THE APP? Search “Virginia History Trails” in the App and Google Play stores and download it for free! 10. DOES THE APP GIVE ME FREE ACCESS TO THE SITES AND STORIES? No, the app just helps you to navigate all there is to see and do. A separate paid ticket, or reservation may be required at some sites, so please check in advance. 11. WHY ARE SOME OF THE SITES JUST ROAD SIGNS/NOT ACCESSIBLE TO THE PUBLIC? Virginia’s landscape has changed a lot in the past 400 years, and not all of its historically notable locations still exist. These stories still need to be told, so we invite users to learn more, even if they cannot visit a physical site. 12. IF I CHOOSE TO CREATE A PROFILE IN THE APP, WHERE DOES MY PERSONAL INFO GO? The 2019 Commemoration will not sell or use your information for marketing purposes. This information is for login purposes only. 13. HOW DO I GET ACCESSIBILITY INFORMATION PERTAINING TO LOCATIONS LISTED IN THE APP? To learn more about accessibility, please contact the historic sites directly. 14. HOW DOES A MULTIGENERATIONAL FAMILY LEARN ABOUT ALL THE THINGS TO SEE AND DO? 15. ARE THERE OTHER USES FOR THE TRAILS BESIDES TOURISM? Yes! Teachers, parents, and students are encouraged to utilize the app as a resource for school projects and assignments relating to Virginia history. 16. IS THE VIRGINIA HISTORY TRAILS APP INTERACTIVE? With over 400 stories to explore, make it a game and see how many places you can “check off” as you travel Virginia. Each time you are within .25 mile radius of a story’s location, select the check mark icon. With every check mark, you are one step closer to unlocking unique badges that represent Virginia’s rich history. Be proud! Don’t forget to share your badges on social media and inspire others with what you’ve learned! An amazing journey awaits you on the Virginia History Trails App. Vacationers and “stay-cationers” alike will be amazed to learn about the over 400 stories that the Virginia History Trails have to offer. Just turn on the app’s GPS location function and discover the rich history that surrounds you. If you are traveling from out of town, let us help you plan your trip! 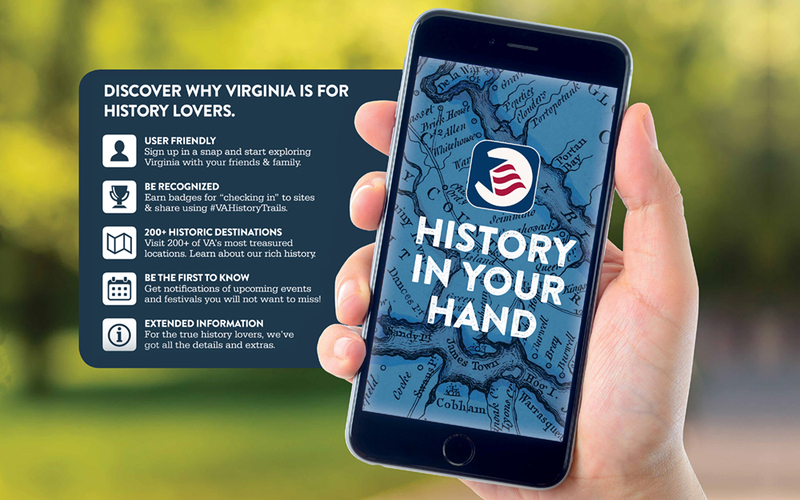 The VA History Trail App is truly for everyone, but particularly perfect for history lovers, family road trips, teachers and classrooms, day-trips and long weekend getaways, tour and bus operators.